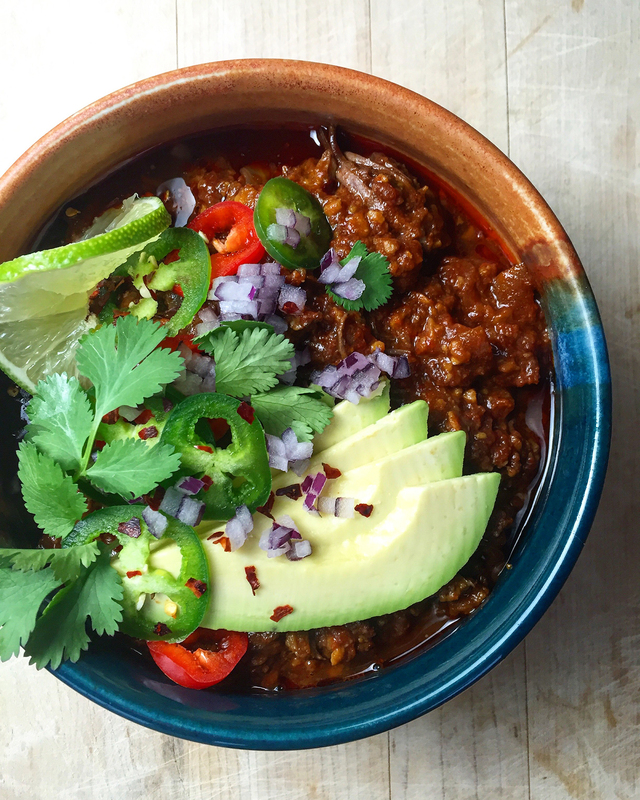 The recipe for this Slow Cooker Short Rib Chili has been on my mind for a long time, since the recipe for a very different short rib chili from Food 52 landed in my inbox, in fact. While the Food 52 version incorporates beer and tortilla chips, I decided to go in a different (but similar?) direction with sweet potatoes and coffee. I know, I know. Maybe not similar at all! But good. Great, even. I’m a chili non-traditionalist. I like my chili thick, rich, and sweet—without beans—and I’ve been known to add heretical things as chocolate (this version contains just a bit of cocoa to round out the coffee) and fish sauce… although the recipe below derives its savory umami flavor from tomatoes, both diced and in paste. I’m also a toppings addict, and don’t have the discipline to leave off cilantro, creamy avocado, bright fresh chilies, and the zing of onion and fresh-squeezed lime. Wash and peel the sweet potato, cut into rough chunks. Pulse the sweet potato in a food processor until finely shredded. Melt 2 tablespoons of coconut oil in a large skillet over medium heat, and cook the shredded sweet potato until lighter in color and beginning to soften. Transfer to a slow cooker. Roughly chop the onions and melt 1 additional tablespoon of coconut oil in the skillet over medium heat. Cook the onions with the marjoram until soft and translucent. Dice the garlic and cook for 1 minute with the onions until fragrant, then clear a space in the bottom of the skillet, add the tomato paste, and cook for 1 minute more until it gets a little caramelized before stirring it through the onions and garlic. Transfer the mixture to the slow cooker. Using kitchen shears, snip off the stems of the dried peppers and shake out most of the seeds (unless you prefer a fierier chili, in which case leave in as many as you like). Bring the broth to a boil, then soak the dried peppers until they are soft (approximately 15 minutes). Place the softened peppers with their soaking broth in a blender, adding the jalapeños for additional heat if desired. Puree until smooth and transfer to the slow cooker. Season the short ribs well with salt, and set aside. Place a tablespoon of coconut oil in a deep, heavy-bottomed pot and warm until shimmering, then brown the short ribs in batches. While the short ribs are browning, add the coriander, cumin, cocoa, cinnamon, salt, black coffee and diced tomatoes to the combination in the slow cooker. Stir to combine thoroughly. Nestle the short ribs deep in the slow cooker's contents, then cook on high for 5 hours until the meat has completely separated from the bone. Let cool enough to handle, then shred the short ribs into the chili using two forks or your fingers. 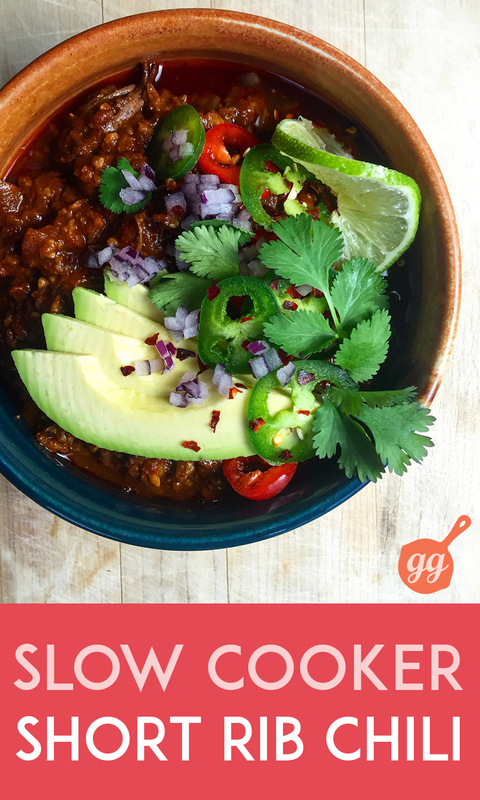 Taste and add additional salt if desired, then serve warm with additional toppings such as fresh jalapeño and/or fresh chili slices, chopped onions, cilantro, avocado, and a squeeze of fresh lime. Wow! This looks delicious – traditional or not 😉 I also love my chili nice and thick, but I’m still a traditionalists. I’ve never put chocolate or fish sauce, but they I could see how each of those ingredients would add a depth of flavor. I love that there are sweet potatoes in this dish 😀 All the other yummy flavors, too, but sweet potatoes would be a first for me. Can’t wait to try it! Here in Texas, where I live, chili is a religion of sorts and people love a new flavor. This sounds really yummy! As a busy mom the crock pot gets a lot of use in my house. Will be trying this new dish! Do it! I’m from Texas, too. An Austin gal myself. This looks delicious! Beautiful photos too! Pinning. This looks outstanding! It’s always a good time when I get to use my slowcooker. The combination of peppers in this meal must be mindblowing! Thanks! Wow – this looks DELICIOUS! I love making things in the slow cooker too – so convenient! Wow, this sounds so flavorful!! I think I could modify it easily just a tiny bit to suit my dietary needs (I would use lean venison instead of beef because of the starchy sweet potato). It just sounds like it’s bursting with flavor, perfect for a cold winter evening. A good mole is just about my favorite comfort food- love these similar flavors, and the sweet potato’s contrast. Lovely! These ARE similar flavors, you’re right! That sounds amazing. Your pictures are always so beautiful! I have some pork ribs that came with our half pig this fall – I wonder if this would work for that! This looks incredible! I could really go for some of this right now! Cold rainy day here in SoCal (say WUT!). This would be perfect! Mmmmm….the pics make me hungry! 🙂 Love your work.